It looks like North Korea is now in the cruise missile business. Talk about translating a noun into a verb. Although most of our attention has been focused on the many kinds of ballistic missiles that North Korea builds, tests and too often sells, modern cruise missiles are a new and potentially destabilizing addition to North Korea’s missile arsenal. Rumors began circulating a week ago, starting with the Chosun Ilbo, that a North Korean propaganda film had surfaced showing a new cruise missile. I tracked down the film, entitled “백두산훈련열풍으로 무적의 강군을 키우시여,” which it turns is available on social media websites like YouTube. It’s very long and features plenty of sweaty all-female artillery units, much to Kim Jong Un’s delight. The film also offers a very, very brief glimpse of the missile. Near the very end of the hour-long film, around 49:19, a North Korean ship launches a cruise missile. Did you miss it? The scene lasts for all of a second or so. Here are four stills showing the missile launching from what appears to be a ship. The video confirms a surprising fact: the cruise missile is a copy of the Russian-produced Kh-35. Here is a comparison with a photo of a Russian KH-35 being launched from an Indian ship. The two missiles appear to be externally identical. Image left: KCTV; image right: Indian Navy. The Kh-35 Uran is a sea-skimming anti-ship cruise missile similar to the French Exocet or US Harpoon. (Did you know that some people call the Kh-35 the Kharpunski—say it slowly. Harpoon-ski. It’s a joke. Get it?) As the name suggest, these cruise missiles fly at a very high speed just above the water’s surface in order to target ships. The Kh-35 is a relatively modern cruise missile developed during the 1980s and 1990s. You can watch a nice little animated video of virtual Kh-35s sinking virtual ships that gives you an idea of how they work. The Kh-35 also comes in land-based coastal defense batteries, a system called Bal. The Russians even have a helicopter carried variant. North Korea has been enhancing its maritime strike capabilities, starting with the introduction of a new frigate. Joseph Bermudez Jr. recently published an article here at 38 North documenting North Korea’s new helicopter-carrying, missile-armed frigates (FFGH). “North Korea’s deployment of new helicopter frigates may be an important wakeup call,” Bermudez wrote, “not only about the overall effectiveness of sanctions in constraining Pyongyang’s conventional military programs, but also the need to carefully and realistically reevaluate reports of its conventional military decline.” Scott LaFoy followed up with a post at Iron & Rice wondering just what the North Koreans are thinking. Over the past year, there have been scattered reports that North Korea might be developing a cruise missile. In 2013, James Kowalski, then the Commander of US Air Force Global Strike Command, showed a slide that listed a North Korean coastal defense cruise missile called the KN-09. There were press reports that North Korea might have tested a KN-09 during the rocket launches in March, but many outlets described the system as a kind of artillery rocket, not a cruise missile. The new clip appears to answer the question of what the KN-09 is. 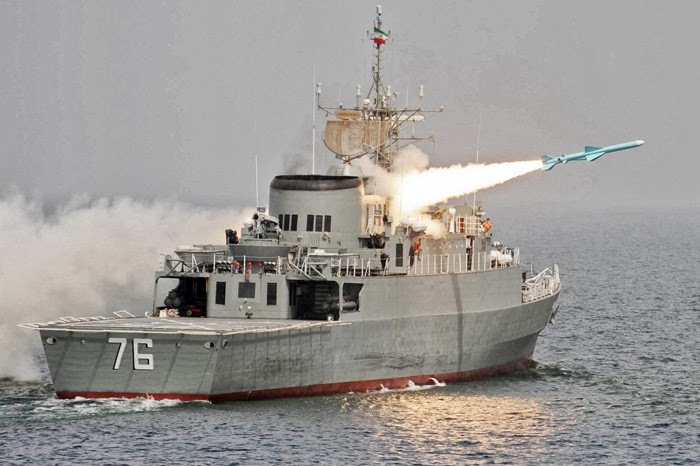 Most of the speculation had been that the missile would resemble either the Chinese C802 or Iranian Ghader cruise missiles. So, the Russian-supplied Kh-35 comes as a bit of a surprise. Where did North Korea get the Kh-35? Well, Russia seems like the most likely candidate. Moscow has exported sea- and land-based Kh-35 systems to a number of other countries, including Algeria, India, Vietnam, Myanmar and Venezuela. There is no prohibition against exporting the Kh-35, which is configured to carry a 150 kilogram payload to 130 kilometer. It falls below the 500 kilogram/300 kilometer threshold set by the voluntary Missile Technology Control Regime. Any export of cruise missiles to North Korea, however, would be prohibited by UN sanctions. Although direct sale from Russia seems most likely, it is possible that North Korea obtained them from a third party like Myanmar. One would expect North Korea to attempt copy production of the missile, much as Pyongyang built its missile industry on the basis of an import of Scuds from Egypt in the late 1980s. The Kh-35 is a capable cruise missile that can be modified to perform land attack missions. The technology base associated with copy production of the Kh-35 could support the development of larger, longer-range systems in the same way that China worked its way up from the C802 to bigger and better cruise missiles. Russia’s Kh-35UE, for example, has an advertised range of 260 km—double the standard Kh-35. It would seem that the appearance of a North Korean Kh-35 indicates a new interest on the part of the North Koreans in cruise missile capabilities. South Korea, too, is developing a cruise missile: the Hyunmoo-3, which resembles the US Tomahawk cruise missile. Both North and South Korea may develop long-range land-attack cruise missiles in the coming years to put some hardware behind the assassination threats they trade regularly. The introduction of such capabilities on the Korean peninsula is unlikely to enhance stability. An indigenous DPRK cruise missile capability also raises concerns about the global spread of advanced weapons. For many years, experts have warned of a coming wave of cruise missile proliferation. Recent US Department of Defense reports have identified a number of signs that the era of cruise missile proliferation is now upon us. The possibility that North Korea might sell Kh-35 technology to others, as Pyongyang has popularized the Scud, is not a happy thought. As I have argued before, the implication of new North Korean capabilities is not that Kim Jong Un is crazy or that the KPA is ten-feet-tall, but that Washington needs to work more energetically to engage the North Koreans. I say this fully aware that such engagement is likely to be slow, painful and largely unsatisfying. But it remains necessary. Sloganeering, such as “translate denuclearization into a verb,” is not an adequate response to the North’s growing nuclear and missile capabilities; capabilities that will become harder to address the longer we wait.